The Surfrider Foundation Eastern Long Island Chapter announces Surf Movie Night XVI at Guild Hall, 158 Main Street, East Hampton, on Wednesday, August 1 at 7:00 p.m.
All of the proceeds from Surf Movie Night XVI will support the Surfrider Foundation Eastern Long Island Chapter’s clean water and healthy beaches programs. This event not only provides the local community with a night of surf entertainment, but it also encourages everyone to learn about how to get involved in protecting our ocean, waves and beaches. Tickets, which are $20 for adults, and $5 for children 18 and under, are available at Eventbrite and at the door at Guild Hall, 158 Main Street, East Hampton, on the night of the event. You can also learn more about the event and share it with friends on our Facebook page. Surf Movie Night XVI is hosted by Andy Brosnan, chair of The Eastern Long Island Chapter. 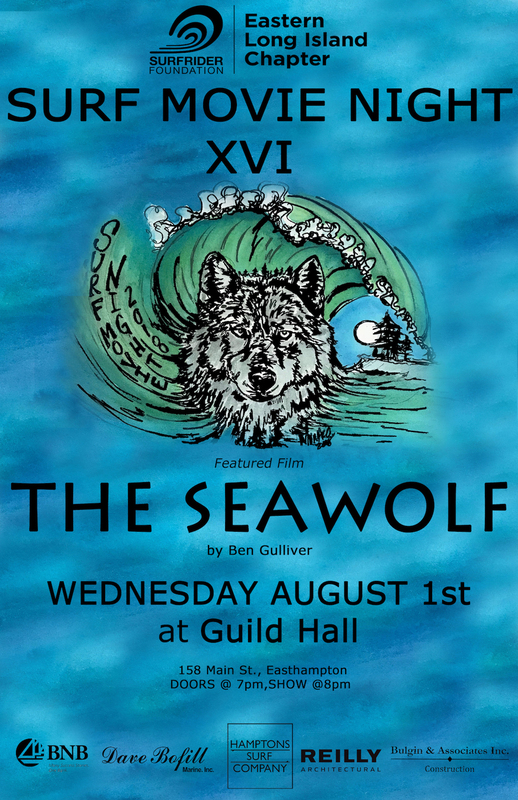 The main feature film will be “The Seawolf”, an artistic piece of cinematography about winter surfing, created and directed by Ben Gulliver. The film follows eight surfers on a two-year journey to the farthest corners of the globe in search for clips. The night will also feature local surf shorts. Along with films, there will be courtyard exhibits highlighting chapter programs and initiatives and a raffle and silent auction. An all ages event, this is a great family tradition and serves as the primary clean water fundraiser for the chapter. Surfrider Foundation’s mission is the protection and enjoyment of the world’s oceans, waves and beaches through a powerful activist network. The Eastern Long Island Chapter has been a strong advocate of public access and environmental preservation along our shoreline from Montauk Point to Moriches Inlet for over 15 years. Staffed by a dedicated team of volunteers, the grass roots chapter works with every level of government on resolving many important coastal issues. In addition, dozens of beach cleanups, educational programs, and dune plantings have been done with local students and community members. To-date sponsors for Surf Movie Night XVI include Bulgin & Associates, Hampton Surf Company, Reilly Architectural, Dave Bofill Marine, and Bridgehampton National Bank.